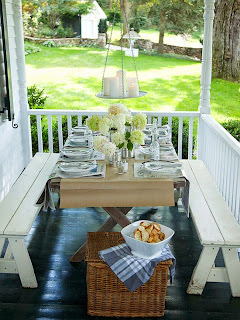 A rustic, farm-style table is paired with two white modern chairs and a contemporary outdoor love seat. A cool color palette of wood tones, white, and green make the three pieces work together and the juxtaposition of styles adds visual interest to the dining area. 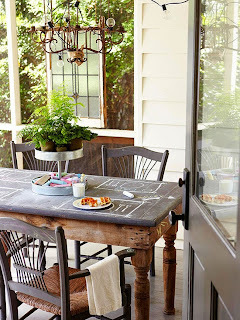 A table topped with chalk paint gives adults and kids alike, a fun drawing surface while corbeled table legs bring a certain elegance to the mix. 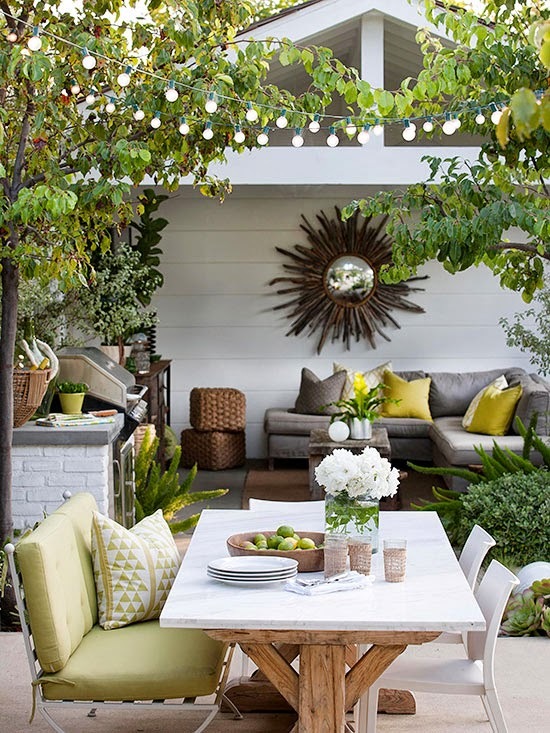 A color palette of charcoal gray, white, and brown keep this patio feeling sophisticated. A wiry chandelier gives the space a slightly vintage feel. 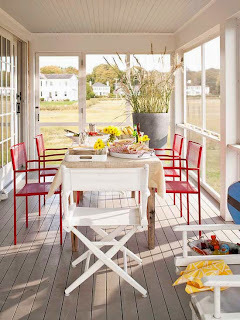 On this small porch, a slim folding table is paired with white wooden benches that allow for several people to share a meal. A painted black floor adds contrast to the white benches, railing, and siding of the house and a contemporary light fixture gives the space a candlelit glow at night. Simple, geometric shapes make this screened-in porch feel modern and up-to-date. Bright red chairs add color to the scene while a gray floor helps to further define the space. A clean linen tablecloth gives the space a relaxed, beachy vibe. 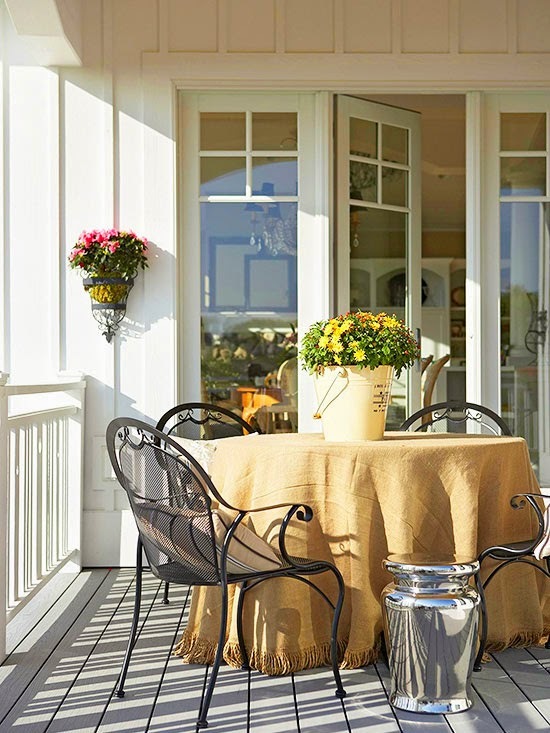 A Spanish-style table and chairs add warmth to this small patio. Burlap sacks cover the backs of chairs for a unique and eclectic look. 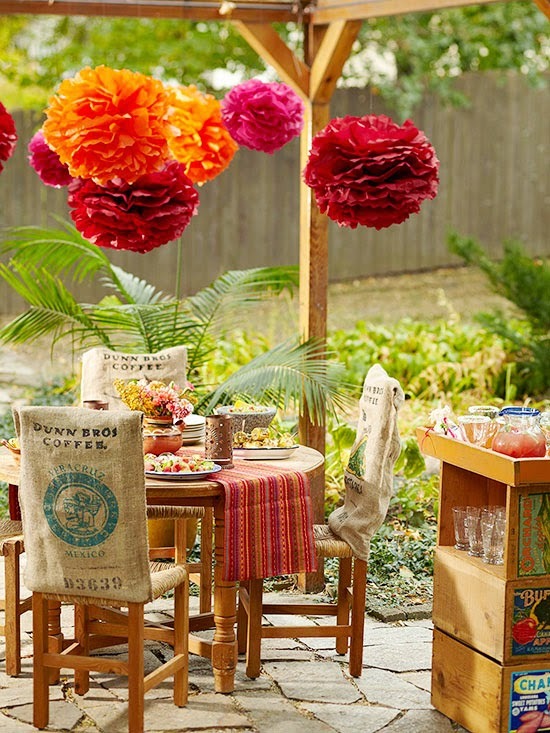 Tissue paper pom-poms bring a bit of whimsy to the space while matching perfectly with a striped table runner. A rustic stone floor finishes off the look and connects the patio to the garden. A burlap cloth brings texture to this metal table and chair set and even adds some country character. Little touches like fresh flowers and a bucket used as a planter make this small space feel quite cozy.